The Champion Sports Deluxe Medicine Ball Cart is designed with a sturdy powder coated steel frame (1" square tubing). Featuring 3" heavy-duty swivel casters for smooth transport, this cart can hold up to twenty medicine balls of any size and weight. The Double Medicine Ball Storage Tree is an effective and attractive way to store all of your medicine balls. 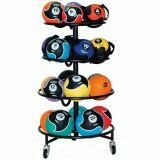 This double sided rack is constructed of durable steel tubing and can hold up to ten medicine balls of various sizes and weights. 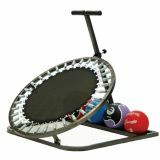 The Medicine Ball Rebounder is a multi-purpose exercise and fitness tool. Made of heavy-duty steel tubing, the rebounder can adjust up to a 60 degree angle. A Neoprene handle provides stability, while a built in tray stores medicine balls. 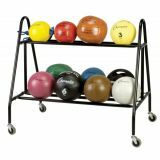 The Champion Sports Medicine Ball Storage Cart provides convenient storage for your medicine ball collection. Made of heavy-duty steel tubing, this cart can hold up to fourteen medicine balls and sits on an extra wide base with ball bearing casters. 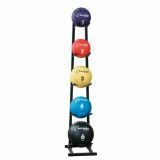 Maximize your space with the Champion Sports Medicine Ball Tree. 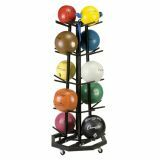 This storage rack is made of high strength steel tubing and can hold up to five medicine balls of various sizes and weights. Designed to fit in a corner, the Champion Sports Select Medicine Ball Rack features six rotating tiers for easy access. 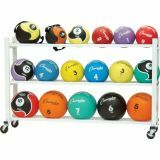 This rack holds up to twenty four medicine balls, and is easily transportable on smooth ball bearing casters. 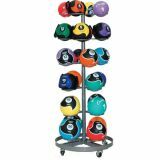 Portable and compact, the Champion Sports Sure Fit Medicine Ball Rack conveniently has 4 rotating tiers that allow for easy access to up to 22 medicine balls. Made of high strength steel tubing, it sits on 3" locking casters for easy transport. 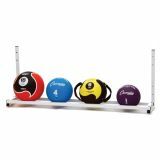 The Champion Sports Wall Mount Medicine Ball Storage Rack frees up space in your gym or exercise equipment closet. 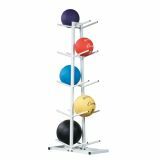 Made of 1" powder coated square steel tubing, this rack has a unique design that securely cradles up to six medicine balls.